Our premium red Anthurium, from anthos, meaning flower, and oura, meaning tail, refers to the many tiny-like spadix. Place in a bright window or on a countertop without direct sun and best to keep a small amount of water in a saucer/tray. Anthurium is the most popular and long lasting of all tropical flowers. These bright red colored beauties (currently in bloom) are the most well known the world over. Our Anthuriums have been specially hybridized for use as houseplants due to their trouble-free growing requirements. This offer is subject to change, so place your order, today! Fertilize monthly at 1/2 strength with a soluable fertilizer found at your local garden shop or on our website.Tray sold separately. With reasonable care your volcano bonsai should last for years. 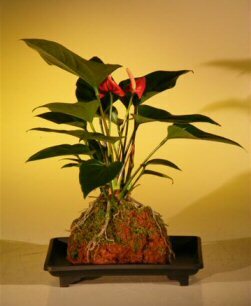 Real Hawaiian lava rock is hand selected to provide a happy home for your Anthurium.